This post begins a series covering Hakuouki, an anime based on the game Hakuouki Shinsengumi Kitan. First let me explain that I am very excited about blogging this series for two major reasons: artwork and Shinsengumi. The artwork promises to be very good. Even in the screencap above, you get a sense of the alley where the sword fight is taking place; the white plaster is chipping off the building, and the light shines off the wood. The Shinsengumi, for those who don’t know, were samurai, and supporters of the Shogun, who acted as a special police force in Kyoto in the 1860s. 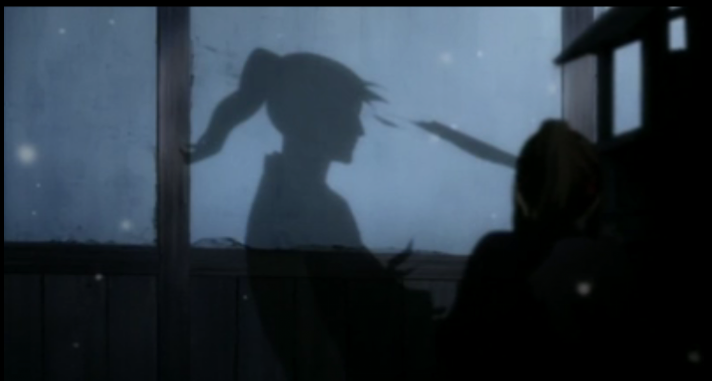 Chizuru discovered by the Shinsengumi. The show begins with snow falling on Kyoto on the night of a full moon. Unfortunately Chizuru, the show’s female lead, can’t enjoy it in peace. Kyoto of this time is known for its lawlessness as revolutionaries sought a return of imperial rule, and Chizuru finds herself chased by outlaws. As stated above, the Shinsengumi, were a sort of police force, but they had a bad reputation, so, even though Chizuru is saved by them, it is evident that some Shinsengumi are quite literally monsters. Chizuru is captured by the Shinsengumi, and thus we are introduced to its various members. Chizuru captive of the Shinsengumi. In addition to the initial fight scene, this episode introduces nine characters and poses some of the basic issues that will develop as plot lines. Some online discussions have knocked the show as being a “talking heads” piece. I think this criticism is unfair. For one thing, Chizuru, the viewpoint character, is held captive for the majority of the episode; she tries to leave her room twice, but finds she is under surveillance. As a result, the show is bound to feel a bit claustrophobic. Also, as just mentioned, the show introduces the viewers to nine characters, and that means getting to hear what they say, how they interact with each other, and what people say about them. It is also an exaggeration to say all they do is talk. It is important to note that the Shinsengumi had a bad reputation. There were incidents when members got into fights, earning them the name “wolves of Mibu”, and they operated on a ‘never back down’, kill or be killed principle, making them administrators of a very rough sort of justice. Hakuouki plays with this reputation in a number of ways. First, when the viewer first sees members of the Shinsengumi (recognizable by their uniforms), they appear to be monsters, laughing as they kill those they meet, but another group of Shinsengumi attack the first. When the Shinsengumi discover Chizuru, they contemplate killing her as the simplest manner of dealing with her, and when she first discovers that she is a captive of the Shinsengumi Chizuru is startled. 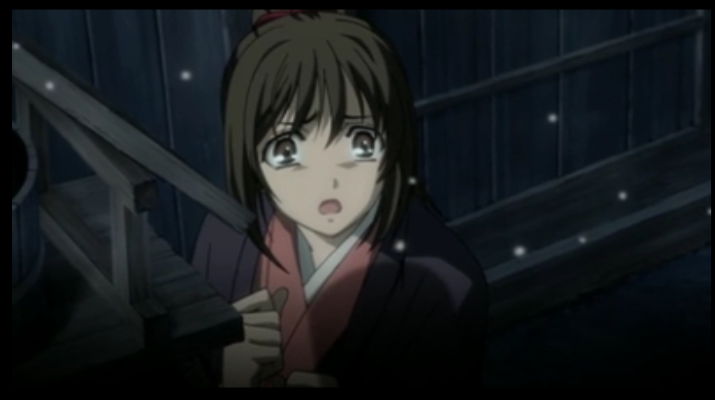 In her interrogation she is threatened with death several times, and after her testimony, she is told to “prepare for the worst.” Finally, when she is allowed to eat with the others, the youngest lets slip something about other Shinsengumi, seemingly the monsters we saw in the beginning, which earns him a blow from one of his comrade in arms. Seemingly the show wishes to both reference and explain the reputation for violence. 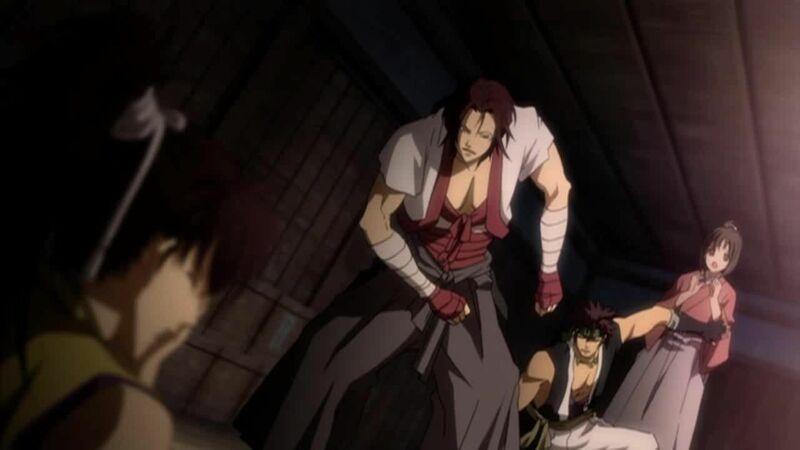 This maintains an aura of danger to Chizuru’s captivity, while opening a window into future plot developments, as the Shinsengumi attempt to hunt to the “failed soldiers”, and Chizuru’s father, who seems to be involved. At the very least, even if the Shinsengumi that Chizuru is held by are not the true bad guys, Chizuru’s father might not end up happily reunited with his daughter. By the way, for those looking for more pictures of Chizuru, here are two nice ones I found online. I was kinda surprised that they painted the Shinsengumi in a– well– somewhat accurate manner, rather than outright glorification that many anime elements tend to do with that group. Yeah, it makes the show much more interesting, I think. Although moving much of the negative aspects of the group onto the “failed soldiers” is a convenient way of rehabilitating them. Still, the tendency to violence, and willingness to kill (as Chizuru puts it “placing the convenience of the Shinsengumi above my situation”) gives the show an edge that a more glorified treatment just wouldn’t have. All I know of the Shinsengumi I learned from Gintama. That made Hakuouki somewhat difficult to follow. you cleared up a couple of questions i had though so thanks again. I’m worried about being able to follow this one past the 3rd episode. Me and the Otome game adaptations tend to not mix. @kluxorious: Actually I haven’t seen Gintama, but I have watched a bunch of samurai movies, so I knew I wanted to see this because I enjoy them so much. @Sapphire Pyro: Thx. We’ll have to see how it goes, but so far I haven’t had any problem with her character. I know some people have complained that she hasn’t done very much, but I think that is a little bit unfair. In reality a girl left alone at that time had very few options. She LEGALLY was NOT ALLOWED to travel on her own. For her to disguise herself as a boy and travel, by herself, from Edo to Kyoto shows a lot of gumption. People seem to be comparing her to fantasized anime heroines instead of a real person. Maybe I’m cutting her too much slack, but so far I think she is a realistic character.